For the women of ancient Rome life was not as easy as it was for their male counterparts. Ancient Rome was a patriarchal society where men dominated the public life and also held authority over their families, and while women in ancient Rome were considered citizens of the empire, they could not vote or hold public office. This restriction decreased the visibility and importance of women in public life and thus not many famous Roman women are known. Nonetheless, despite all these restriction, some women in Roman times did rise to important administrative and even military positions and left their mark on history. The History of women in ancient Rome actually begins with founding of this empire since several women feature in its founding mythology. For instance, Lucretia was one such woman of ancient Rome whose history was elevated to the status of legend, and she is said to have played a decisive role in the transformation of Rome from a kingdom into a republic. Another woman of mythical significance was Claudia Quinta who is said to have brought the goddess Cybele from her shrine in Asia Minor to Rome in order to help Rome against Carthage. The women of ancient Rome also show up in the works of poets and philosophers such as Ovid, Catullus, Cicero, and others. 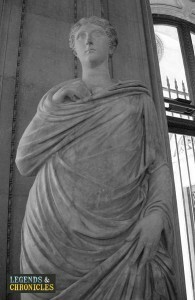 A statue of Julia Antonia Minor, the mother of Emperor Claudius. It was rare for women to play any significant administrative and political role since they could not hold any public office. Nonetheless, important women of Rome were the wives of emperors and politicians who sometimes held sway over their husbands choices and decisions. One famous woman of Rome was Porcia, the daughter of Cato the Younger and wife of Brutus, who came to a heroic end during the civil war at the end of the Roman Republic. 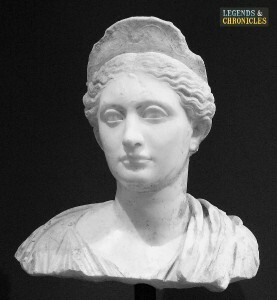 One of the most powerful women of ancient Rome was Livia Drusilla Augusta who was the wife of Augustus Caesar and acted as a faithful advisor and companion to him. The head of family in ancient Rome was the eldest male and a newly-wed woman came under his patronage. However, during the late Republic, this trend changed and the married woman could choose to recognise her father’s family as her true family. The most important role of women in married life in Rome, just like other conventional societies, was to bear children and women who successfully performed this duty were respected. They were also expected to educate their children and make them worthy citizens. For ancient Roman women from common citizenry, spinning wool at home to make clothes was an important activity. There were limited opportunities for women to take part in social activities and even indulge in business and commerce. Therefore we find that many women took part in business, gave out loans, funded public works, and did various other kinds of work. Women could own property and thus engage in land transactions and management. Dealing in land was the respectable profession for the women of the upper classes while working in industry was mainly reserved for the women of lower ranks. However, this attitude changed when Rome became an Empire and Emperor Claudius passed legislation according to which women of upper classes could engage in shipping. The clothing for Roman women times was just like the clothing of men, was different for different social classes. One of the most common tunics that women here used was inspired from the Greek chiton, and it consisted of two cloths sewn together leaving room for arms, and pins or buttons could be used to fasten the garment where required. Another garment typically used by women was called the stola, and this was a long, sleeveless tunic usually worn over another tunic and used for marriages and other ceremonies. For women of prestige and status in Rome, there was also a long cloak known as palla which was reserved for the women of upper classes. Typical day in the life of a Roman woman varied depending on the social standing of the women. For instance, daily duties of the women of ancient Rome from the common people would be to look after their children and their education, prepare food for their husbands and other members of the household, and indulge in sewing and the spinning of wool. Women who were involved in business or land management spent some part of their time in looking after their enterprises. A trip to local bath was also an important ingredient in the lives of many women. A bust of a Roman woman. The duties of women of Rome depended on their social status. For women of lower ranks, looking after the family, cooking food, and sewing were among the common duties. Women who helped their husbands in their work were assigned the duties accordingly. Women of ancient Rome from the upper classes usually had fewer duties and more options to invest their time. Thus they could choose their work such as land management or some other business. Since women of ancient Rome were allowed to do business, they could do various kinds of jobs. During the time of Roman republic the most respectable profession for women of the upper classes was land management while women of lower ranks could work in industry and commerce. However, this changed when Rome became an Empire and a lot of women from the upper classes were involved in the shipping business. Some women helped their husbands in such trades as silver working and perfumery, while other women even held positions or worked as priestesses, midwives or hairdressers. The women of ancient Rome had inferior social status compared to men since they could not vote or hold any public office event though they were considered free citizens. Despite these restrictions some ancient Roman women played important roles in politics and administration of the empire. In family life a husband held absolute authority over his wife and children, women however, had considerable freedom when it came to work and their daily life.